Wait a minute. Just because you use your PC for serious stuff doesn't mean you can't have a bit of fun, too. We've scoured the web for the best free programs that will make sitting in front of your computer a more enjoyable experience, bringing you new wallpapers, free streaming music, free games, and much more. Download and enjoy! For iPod owners, iTunes is an essential application for organising and purchasing music, and now downloading videos and podcasts, too. Bring instant-messaging applications such as Windows Live Messenger together with Digsby, a multifunctional social-networking application. Streaming media can be a fiddly business, and if you use your Xbox 360 as a Windows Media Extender, you might find the restrictions of DivX and Xvid irritating. Transcode 360 converts your files as you play them into files your Xbox can handle. Orb enables you to access your media anywhere in the world, and stream it over the internet. Instead of carrying your music with you, access it from anywhere with an internet connection, using a web page to browse your PC. The free internet TV service promised growth when it launched last year, and it's delivered, with new content being added almost daily, and deals being brokered with major television networks. The BBC's on-demand video service iPlayer has exceeded all expectations, taken the country by storm and is used by millions of viewers. You can stream video, or download programmes to your computer to watch in high quality whenever you want. Take a trip into nostalgia and play those old DOS games in their full glory by bringing DOS back to your PC with DOS Box. The Filter searches your music and video collection to create playlists and suggest others you might like. A great way to discover new music, or to choose from your own collection, which could contain thousands of tracks. Catapulting PC gaming into the 21st century, Steam lets you download and play the latest games and provides a great multiplayer platform, too. Most new games are available through Steam, and it includes friends, groups and invitations. Staying in contact couldn't be easier, and now you can start video calls, voice chat, shared folder sending, webcam viewing and even on-demand TV. Windows Live Messenger is fast becoming an entertainment hub, with millions of users. In a bid to entertain the world for free, EA is launching Battlefield Heroes, a third person cartoon shooter. The game features two sides of foppish soldiers with Spitfires, jeeps and ludicrous weapons for the ultimate in free gaming fun. A popular podcasting program with added functionality for iPods and iPhones, and a number of other devices. Doppler is a great way to keep up with your favourite radio shows. Watching movies on a PC can be a painful experience which requires all manner of codecs and plug ins. VLC offers near universal compatibility and it's open source light code means loading times and high definition movies run in their full glory. Still one of the most addictive PC applications, Google Earth has the power to educate and entertain. To spice things up, check out this list of the world's most interesting sights. Fans of the classic SNES console have to check out this emulator. Using your webcam to play snake is the latest innovation from Microsoft, and could be a glimpse of the future. If you're too cheap to pay out for the new Ret Alert, then just play the old one for free! For the bored or digitally challenged try Zattoo. It has all the BBC channels and a few French ones, too, and the quality is surprisingly good. Sorting your photos has never been easier with the jewel of the Windows Live collection, Windows Live Photo Gallery - but try the little known panorama creator, which is one of the best in the world. 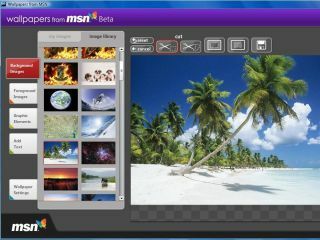 Get over 150 free wallpapers and give your PC a constantly fresh look by rotating your desktop pictures with MSN Wallpapers. Channel 4's on demand program 4OD brings shows like the excellent Fonejacker to your desktop. The easiest way to create ringtones and sample tunes on your PC. Audacity is free, easy to use and surprisingly powerful. Forget Photoshop, if you enjoy playing with images then you need Paint.net. Started as a student project to create a successor to Windows Paint, Paint.net has stayed independent and truly great. Circle Dock is an animated application launcher that makes launching programs easy and fun.